The Desert Pyramid Beckons! is the seventh level of World 2 in Yoshi's Woolly World. The level begins just outside the entrance of the pyramid, with two Pharaoh Guys waiting there. A hidden entrance then leads Yoshi to the pyramid below. The first room in the pyramid contains many flames that Yoshi can eat (and spit out) as well as many Fangs, Wiks, and Pharaoh Guys. The second room, however, takes Yoshi directly to a door with four locks on it, and four different paths. In order to remain consistent with collection of Smiley Flowers and Wonder Wools, Yoshi should take the bottom-right path first. The bottom right path consists of moving platforms consisting of Piranha Plants, Snoots, and Pharaoh Guys. Once Yoshi gets past the area, he comes across another room whee he must light all three torches to reveal the first key. Yoshi must then backtrack through the level until he reaches a green warp pipe. Taking it leads to another Pharaoh Guy and the first checkpoint. After passing some brown warp pipes, Yoshi must enter a green one. It leads to a room with many yarn ball pendulums and Fangs. Upon exiting that area, Yoshi encounters a room where he must use the Flooffs to light more torches to reveal the second key. Once again, Yoshi must backtrack to the door. The next path Yoshi should take is to the top right. The next room consists of many torches and Piranha Plants, Burrberts, and a few Pharaoh Guys. Traversing into the next room, Yoshi must once again rely on a Flooff to reveal the third key. After backtracking through the previous room and to the door, Yoshi must take the top left path. The last path consists of Number Platforms and Fangs. The next room consists of another where Yoshi has to light torches to obtain the fourth and final key. Backtracking to the door finally allows access to it. After a few rooms followed by the second checkpoint, Yoshi approaches a rising platform with many Winged Clouds that produce beads and many Fangs. After the rising platform stops, Yoshi is led back out into the open, where the goal roulette awaits. Smiley Flower 1: Inside a hidden alcove in a platform that the first Piranha Plant guards on the moving platform below. Smiley Flower 2: In a hidden Winged Cloud between the last two pendulums. Smiley Flower 3: In a hidden Winged Cloud between two Number Platforms. Smiley Flower 4: Inside an alcove blocked by a Flipper. To get it, Yoshi must flutter jump to reach a hidden path above that connects to the alcove. Smiley Flower 5: In a hidden Winged Cloud near the end of the rising platform section. Wonder Wool 1: Just before the second green warp pipe, Yoshi can push the right wall, which will reveal the Wonder Wool. Wonder Wool 2: Not long after the first Smiley Flower, in a hidden Winged Cloud in between two moving platforms. Wonder Wool 3: Just before the first checkpoint, in a hidden Winged Cloud directly above a Pharaoh Guy. Wonder Wool 4: Just after the first checkpoint, in a hidden Winged Cloud right at the top-center Pharaoh Guy-spawning brown warp pipe. Wonder Wool 5: In the room with the Number Platforms and Fangs, high up in a hidden Winged Cloud. 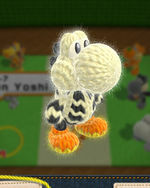 Collecting all of the Wonder Wools knits Skeleton Yoshi back together. This page was last edited on January 17, 2019, at 12:40.